A surprise late Christmas gift arrived in the post the other day. It was actually a prize from Rose of Now & Then Delicious for the mince pies I made from orange pastry and my homemade chocolate mincemeat. I was well chuffed that I’d won and really pleased to have this little copy of baking: 100 everyday recipes published by Parragon Books arrive through the post. It has lots of standard recipes in it, but also quite a few little gems, such as fig and almond muffins, that I’m quite keen to make. As I had a friend’s birthday cake to bake, it seemed only polite to try one of the recipes from this book. Chocolate fudge cake was the chosen one. This was a 20 cm sandwich cake; as I don’t have any 20 cm moulds (I really must get some as they would be REALLY useful), I thought smaller would be better than bigger, so went for an 18 cm cake and four cupcakes. I also cut down the quantity of ganache used. Creamed 175g unsalted butter with 175g vanilla sugar (caster) until well incorporated and fluffy textured. Beat in 3 tbsp of syrup and a pinch of salt. Beat in 3 medium eggs alternating with a spoonful of the flour mixture. Sieved in 175g flour (half wholemeal, half white), 1/2 tsp baking powder, 1/4 tsp bicarbonate of soda, 40g cocoa powder and 40g ground almonds. Stirred this in alternating with about 50 ml of milk (although would have used water as stated in recipe if I didn’t have some milk that needed using up). Spooned into two buttered 18cm tins and 4 cupcake cases. Melted 150g dark chocolate (used Green&Blacks 72% cook’s chocolate) in a heavy pan over a gentle heat with 1oz dark muscovado sugar and 110g unsalted butter. Added 5 tbsp double cream and 1/2 tsp vanilla extract. Stirred and left in my cold kitchen for about 1/2 an hour to firm up – but not set! Used some to sandwich the two cakes together, then spread most of the rest over the top and around the sides of the cake, leaving just enough to top the four cupcakes. Decorated with silver stars on top and alternating pink and white sugar flowers around the edge. The cake proved to be a great hit at the impromptu birthday party, which followed on after a brisk walk along the river Fowey. It was a nice moist cake with a good slab of ganache in the middle. If that sounds solid, it really wasn’t. The ganache had a melt in the mouth texture and was darkly chocolatey. It also tasted slightly fudgey due to the brown sugar, but was not overly sweet. Congratulations on winning. The chocolate cake look delicious. That doesn’t sound heavy at all. It looks amazing. Gorgeous. I would be seriously happy if someone gave this to me for my birthday. Wish I could dip a finger into the icing right now! Happy Belated Birthday! This cake sounds and looks so yummy. Yum! It looks so good, and well done on winning! now THAT is a cake! Thanks for the recipe. Now that’s what I call a serious cake. Great for a birthday. Now that sounds like a great chocolate cake! I love the sound of the ganache. I tend to stick to buttercream out of habit but I should really try this for a change. Congratulations on the win! No birthday is complete without chocolate cake- lovely Choclette! Chocolate fudge cake must surely always be a winner, especially at a birthday party! The ganache sounds lovely! Wow this looks heavenly! As does the walk too. Love Cornwall! Wow, that cake looks amazing. I could do with a hunk of it right now. You have a very lucky friend! That ganache looks gorgeous! Cant beat a good chocolate cake for a birthday. The last picture is beautiful too! Katie – thank you. It was especially fun knowing I’d won something, but not knowing what until it arrived through the door. Gill – no, it wasn’t in the least heavy, although I do quite like heavy cakes – anything as long as they are not dry. LittleLoaf – a fingerfull leads to … well lets just say I was rather generous with what I left in the bowl! NP – thank you, you’re welcome. 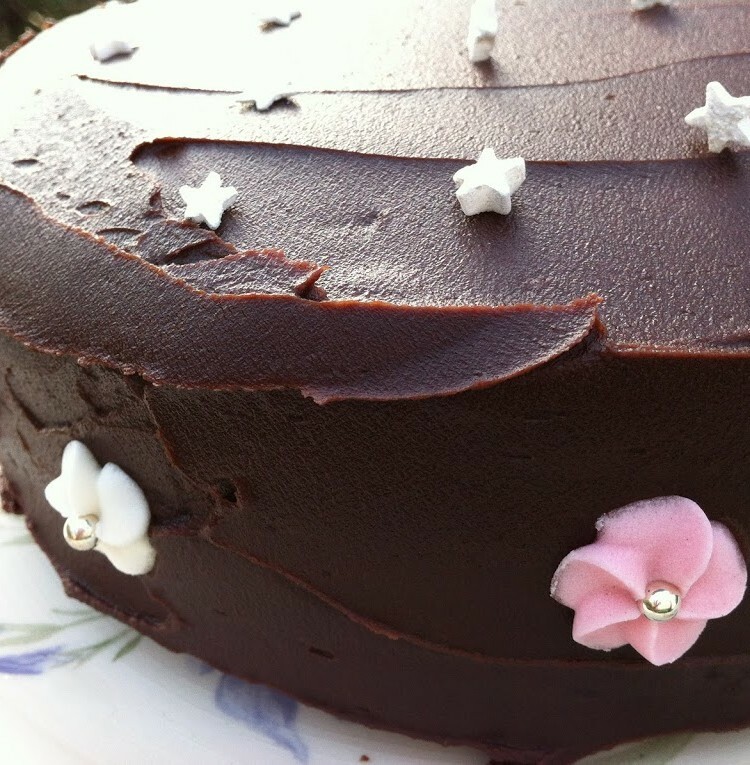 Phil – it was a very good cake and the ganache was scrumptious, but reckon it wasn’t a patch on our nonnettes! Jo – this ganache was a lot lighter than butter cream and not nearly as sweet, but it’s nice to ring the changes and a good butter cream is hard to beat. Kate – you’ve got it bang on – thank you. C – touch wood, haven’t had anyone turn their nose up yet! The ganache was a good one – dark and quite shiny. Charlotte – thank you. I’m very lucky to live here – love it. Missflash – I usually bake half wholemeal half white and the cakes usually come out very well. Baking addict – I’m not a fan of tins as can’t stand lining them. For once I did use tins rather than silicone moulds though as I didn’t have anything small enough. Two 20″ silicone cake moulds are a must for 2012! Johanna – yes, see above. It’s caused me no end of grief trying to make my cakes look taller when their baked in larger moulds than they should be. Hannah – thank you. It was really nice to get out – it’s been rather wet and miserable here for weeks. Looks heavenly and followed by such a lovely walk too I think you would need that afterwards! Congrats on the win. Perhaps you better enter my valentine bake and craft competition as wins come in 3’s don’t they? Thank you – will be over to check out your competition. Would be good to be on a winning streak! Wow this looks so inviting!All your baking on your blog looks very good. Well done! This is the ultimate birthday cake! Gorgeous! It’s getting harder and harder to choose which is the best these days. I’ve made so many good ones now. It was easier in my pre-blogging days, when I had only three go to chocolate cakes. Ooh now was a wonderful looking cake, congratulations on winning! Such a pretty cake with those flowers. It looks YUM! Thanks Janice – sometimes girly flowers are just what is needed! Happy Belated Birthday and congratulations on winning too! LOVELY LUSH looking cake, I adore chocolate fudge cake! Karen, thank you for your very belated birthday wish – my birthday was back in July! Thanks for the feed reminder, but I thought I’d updated it as soon as you moved – I’ll check it out. Birthday was many months ago now and next one many months to come, but thanks for the good wishes anyway Dom, always good to have. OH! Yes I can see you are replying inline to comments now….looks good! Such a beautiful chocolate cake. Ah the photograph brings back memories of when we too walked along the riverbanks of the River Fowey. Thank you Maggie. I hope they are good memories. We went walking along a different stretch of the Fowey today, it’s a lovely river. A beautiful cake to look at. I wonder if I could make it !